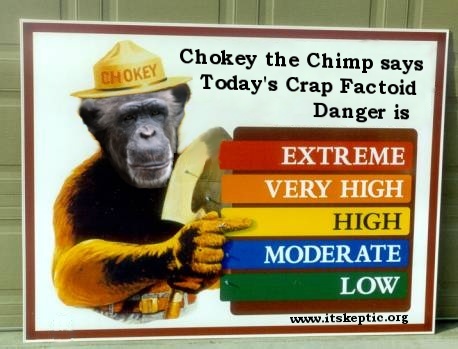 It has been a while since Chokey the Chimp got to issue a Crap Factoid warning, but here we have a Category 2. According to an ITSM Portal report on the EasyVista survey that many of you will have seen around the traps [update: here's the original article from Staff&Line, the vendor of EasyVista], "Nearly 87% of respondents said they felt negatively toward their current service desk solution". I find it a bit rich that the article says "ITSM vendors are deliberately ‘muddying the waters’" [update: and it opens with "They say there are lies, damned lies and statistics. Sometimes though, there’s just no escaping the facts"!!!!] when this vendor survey is based on such a misleading biased statistically-invalid survey as this one, and draws such outrageous conclusions. the raw data is not provided to allow the results to be checked. 87% of what? 1. In addition to the basic purchase/ticket price, which of the following costs has your organization incurred since it purchased its current service desk solution? 2. For those who encountered unexpected, extra costs, what has been the impact of these unexpected costs on the original purchase price of your current service desk software solution? "Very pleased"? How about just "satisfied"? - not an option. And the article makes some outrageous derivations from the numbers: " their number one long term cost is incurred by daily code tweaking, above their existing maintenance and integration contracts". There is no question in the survey that could possibly support the inference of "daily" or "code tweaking" or that it is "above their existing ...contracts". And "48.4% don’t know how much unexpected cost coding added" is so sensationally misleading as to possibly be Chokey's prize Crap Factoid for the year. it is certainly crap. 48.4% chose "don't know" because the emotive and badly-worded question offered them no other option. The one that made me chuckle is "25.8% complain that there is always an additional cost when asking their vendor to do anything". Perhaps people think software should be operated on a Ponzi scheme where new buyers fund the existing customer base's service requirements. Or perhaps software vendors should act as charities, funded by donations and government grants. One hopes our industry is maturing to a point where it realises that vendor surveys found on the web are not worth the paper they are written on. But I doubt it. Sadly this bilge will get picked up and reproduced on powerpoint bullets until it becomes lore. I don't know about Staff&Line, vendors of EasyVista, but I expect better of ITSM Portal. Next story: New itSMF newsletter - boon or burden? Submitted by ServiceSphere on Thu, 2010-07-08 15:12. For the love of Service Management please have chokey reconsider this fine bunch of Marketing pros....I mean ITSM fellows.